Funding: Funded by European funds, managed by council, as a result of our consultations. Along with the Griminish Residents' Association, we had been pressing for improvements to the old route from Griminish to Liniclate. This derelict right of way had once been a proper road, but years of heavy use with farm equipment eventually damaged the track and the drains, and it was often very wet indeed, to the point of being unpassable. The challenge has been taken up by the council's Countryside Access Officer, Rhodri Evans, who added this route to his portfolio of access projects. 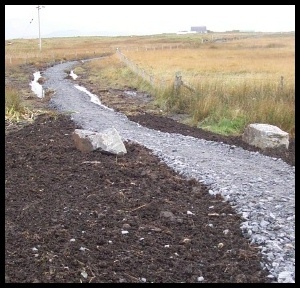 Comhairle nan Eilean Siar was recently successful in obtaining European funding through the Highlands and Islands Special Transitional Programme for developing the footpath network with a project called the Western Isles Countryside Access Programme. This money is being used to improve this route, as well as others. The footpath is now complete. 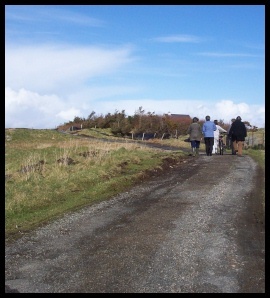 We walked from Griminish to Liniclate to check the path. In spite of heavy rain, the path was well drained, and firm underfoot, wide enough to take two walkers. 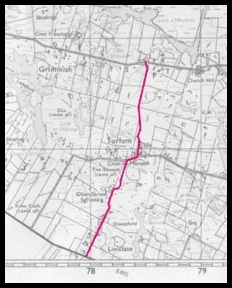 Once we reached Torlum we took a turn to the right along the road, and then down to the left to continue towards Liniclate, as the right of way continued. It was wonderful to see the familiar landscape from another perspective. I hadn't realised that there was such a hill coming down to Torlum School! We also came across a tyre swing, and some flurries of hail. 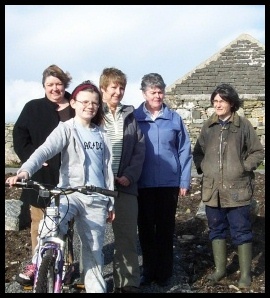 For more information of walks in and around Iochdar and Benbecula, please visit Walk Hebrides.